It has been argued that Modernist Christianity has been moving in a direction that is no longer only heretical but apostate. Modernist Christians and many who identify as “spiritual but not religious” do not actually follow or believe in the God of Abraham, the Holy Triune God at all. Rather they believe in a celestial santa of their own invention with no criteria outside of their hopes, presumption or sentiment. This god is not compatible with the Christian God. St. Peter (then called Simon, son of Jonah) was a fisherman in Bethsaida along with his brother, St. Andrew, and the sons of Zebedee, Sts James and John . He was married prior to becoming the first apostle ordained by Jesus in the early Church. Blessed are you, Simon son of Jonah, for this was not revealed to you by flesh and blood, but by my Father in heaven. And I tell you that you are Cephas (Peter) (Petros), and on this rock (petra) I will build my church, and the gates of Hades will not overcome it. I will give you the keys of the kingdom of heaven; whatever you bind on earth will be bound in heaven, and whatever you loose on earth will be loosed in heaven. (Matthew 16:13–19). Peter served as bishop of Antioch for seven years and left his family in there before his journey to Rome where he became its first bishop. During his ministry St. Peter, healed preached and taught. He was the leader of the apostles, selecting a replacement to Judas and becoming the first pope (papa) followed in succession by St. Linus. St.Peter was crucified in Rome under Emperor Nero. He was crucified upside down at his own request, since he saw himself unworthy to be crucified in the same way as Our Lord Jesus. St. Paul’s conversion can be dated ~32AD while travelling on the road to Damascus, where he reported having experienced a vision of the resurrected Jesus. He was blinded for three days and had to be led into Damascus by the hand. During these three days, Saul took no food or water and spent his time in prayer to God. When Ananias of Damascus arrived, he laid his hands on him and said: “Brother Saul, the Lord, Jesus, that appeared unto thee in the way as thou camest, hath sent me, that thou mightest receive thy sight, and be filled with the Holy Ghost.” His sight was restored, and was baptized. He became one of the most important of all the saints. Many of his writings became Canonical Scripture and form much of the New Testament. He traveled the world, first to Arabia then back to Damascus. He also visited Jerusalem to see St. Peter, the first pope and stayed with him at his home for a half month. After a time he returned to his hometown of Tarsus, and he preached there until he was called by St. Barnabus to come to Antioch. After a year spent in Antioch, a famine occurred in Jerusalem and he and St Barnabus visited with alms. He travelled to Spain and the East, and finally returned to Rome once again. In 67 AD, Paul was arrested in Rome for a second time and this time he was beheaded under the Emperor Nero who knew . Paul personally. 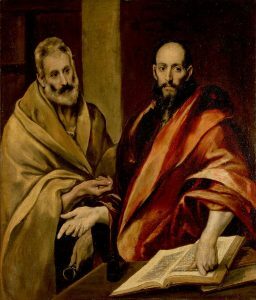 O God, Who made this day holy by the martyrdom of Your Apostle Peter and Paul, grant Your Church to follow in all things the teaching of those from whom she first received the faith. Is the “discrimination” that muslims experience today equivalent to that of early American Catholics? I thought it was an excellent counter point deserving of discussion. So I share my thoughts which I hope you’ll find useful. Many folks do not realize that in early British North America there was serious Catholic discrimination. On the right to vote, hold land, commerce employment etc. And in the article shared above the point is made that just as Catholics became normalized/ acculturated so may Islam. So let’s learn from our past and be welcoming/accommodating. 2. Is the anthropological and socio-political situation equivalent (or even similar) between the Catholic (and other discriminated immigrants) and the current perceived plight of the muslim and “islamophobia”. What data forms our view? We also have to acknowledge an assumption from the “diversity is an absolute good” crowd. The “progresso-left” hopes/assumes that secularization is the inevitable trajectory. That smart, educated people cast off religion. That someday we’ll live in a Star Trek utopia of equality and co-existence. We’ll all share one common successor to “religion” that is spiritual more than formally religious. Those who disagree do so SOLELY because their fear their privilege is threatened. I would argue this view is not supported by history, social or behavioral science data (note, I said data not “experts”). So it sounds nice (to many). Is it so? Instead, I’d suggest that nature abhors a vacuum and the practice of formal religion is hardwired. Some variant will soon return and it may be unlike many that preceded it, but return it shall. Not all religions are created equal, not are equally good. Need proof? Read about Carthage or Aztec ritual and compare with Buddhism or Mother Theresa. Compare the actual Koran with the Gospel. Compare the actual biography of the FOUNDERS. Use THEIR sources not those of their enemies to determine this. When I explored Christianity as a young adult I wanted to make up my own mind. I didn’t have a day of Sunday School. No church “brain-washing” as many secularists assume. I had a bible which I read through several times and a spiritual experience. Which led me to explore becoming a Presbyterian or other protestant but before I did I had to investigate and answer every objection to Catholicism in THEIR words- from their saints. I listened to both sides from the best each side had to offer in their own words. I ended up Catholic only to find later most modern Catholics didn’t believe in that old Faith either. It is from this process and experience that informs my understanding of theological diversity. Catholicism in the United States was suspect until JFK. Why? Think about it- Catholics are more tolerable to non-Catholics when they ceased being distinctively “Catholic”. Dad and Mom grew up as children in a part of Nova Scotia where folks on both sides would throw rocks at one another (Dad was protestant, Mom Catholic) nothing too serious but there was some community discomfort. Our generation doesn’t remember any of that. What changed? Essentially culturally and in its applied theology Catholics admitted “protestants were right” and changed in the 1960’s. They called it the “Aggiornamento” (updating, accommodation, surrender to the world’s wisdom). It was good in terms of less friction in the local community- but at what cost? Aggiornamento is why Pope Francis 2 years ago opted to bless a statue of Luther in Rome vs a public Mass for Our Lady of Victory/ OL of the Rosary. It’s why he doesn’t genuflect at what Catholics once considered the literal Real Presence of God. Even my Presbyterian father did that, not out of belief, but respect. Basically the secularists and Left’s hope that muslims will have the same future dereliction and lukewarmness as Western Catholics- that they will retain some customs- a St Paddy’s day parade here and an iftar dinner there, but will ignore their respective FOUNDERS. Instead, replacing their respective God/god with a syncretist one, a god supported or realized in the State. I think you will see some sort of catastrophe (economic, military, civil unrest?) that will ruin all of this. I cannot predict the details but something will shift; likely in our lifetimes and it will go hard over one way or the other. I guess we’ll find out. So I outlined some problems with the whole frame, now to the questions I mentioned at the very beginning above. 1. Taken from a non-Catholic perspective was it unreasonable to suspect allegiance would be to Rome first, country second? Yes, no? Actually the suspicion was well founded. Roman Catholicism teaches in its normative form something called the “Social Kingship of Christ” which progresso-lefties erroneously confuse with theocracy. Basically it means that all of the social order must be compatible with the Gospel (not that it be run by priests). Further we believe there will be no earthly, sustainable peace or justice if this is not so. Are we wrong? Maybe- that’s another discussion. To a Protestant American this means a Roman Catholic owes allegiance to God, Church, family and then country, in that order. This would be a traitorous view to may protestants or patriots of the time. 2. Is the anthropological and socio-political situation equivalent (or even similar) between the Catholic (and other discriminated immigrants) and the current perceived plight of the muslim and “islamophobia”. How is the scenario described above different from a muslim believing in sharia first and ”law of the land” second? Huge. Catholicism/ normative Christianity teaches obedience to secular rulers unless it is to cooperate in sin, in which case we are to resist even to death. Since our secular society came from the foundation of Christendom (outside of abortion) there are few issues where they conflict. There are no Gospel proscriptions for secular government (other than be honest and diligent in your duties) but in islam’s case they have a highly evolved political philosophy that is theocratic in its normative structure. Firstly, Islam is a political philosophy with a religious component. Christianity is a Faith compatible with many different secular models of governance. You can have a democracy, a kingdom or a religious community- all can work. Therefore Christianity and its Catholic iterations can co-exist with the state. Islam demands modification of the state. Turkey is the best example- look what is going on today. Once a muslim population hits about 20% sharia accommodation becomes demanded and it impacts the non-muslims that share the same geography. Secondly, most of the values between Catholic and Protestant were identical and remained so until 1930 with that year’s Lambeth conference. So the friction was on misunderstanding Catholic rituals and as mentioned above, there was a concern that there was a spiritual-temporal ruler (pope) that would hold their loyalty before their king, president, or PM. There was also (to non-Catholics) this irritating habit of Catholics insisting outside their own Church there was no salvation. I can appreciate that was offensive to religious people of other traditions of the day. But regardless it was still an organ of the same body- the same God, the Same Lord and King Jesus: fully God, fully human that would hold all Catholcis and Protestant to final account (“Dies Irae“). Islam is one of two religions I do not respect. (Do not confuse this with me saying I do not like or respect individual muslims- I’m talking their religion just as the Left hates mine) The other is Scientology. Why can I see wisdom in Buddhism, sincerity in Confucianism, or good in stoicism but not in scientology or islam? They are synthetic constructs with the appearance of religion without true supernatural aspect. In islam’s case a socio-political ideology masked as a religion subservient to a god confused in these days with the Christian one. Easily provable if you have an honest muslim theologian share that from their perspective the Christian God is a polytheist idea that blasphemes by addressing God the Father as “Father”. Outside of Trinity – there is no Christian God. Let me repeat: outside of the Trinity there is no Christian God.- it doesn’t work no matter how the modernist Christians of this day are desperately trying to make it so. (Find me a respected normative Christian theologian who thought so pre-1960). We got it wrong for 2,000 yrs apparently. We’re much more holier and closer to God as a people… So by all means accept or reject either God/god but don’t assert they are “all the same”. No. Does this sound similar to some of the anti-Catholic rhetoric of years ago? Yes it does. Is it the same? No, it’s not. Why? Because one story reflects truth and the other falsity. Isn’t it just a matter of opinion? No, it’s a matter of ontology. Nature abhors a vacuum. Secularism is leading/has led folks to a very dark place. We have tech but no joy. We can simulate happiness via various hedonisms or entertainments but in the end we just crave more and more. What used to satisfy, no longer does. The anthropological mess is blamed on Christendom and the solution is basically “coexist” syncretism and the ascendancy of the United Nations. Islam is very useful to both those ends. Islam and secularism has a common enemy in Christendom, ironically a concept abandoned by most self-identifying Christians. Islam will spread throughout formerly Christian lands and when it hits around 20% the demands to accommodate will grow and grow. Look at “secular” Turkey once considered an example of a “moderate” secular islam- no more. Turkey is a proto-caliphate with its accompanying tyranny. We have a choice to make as individuals and as a nation. I’m not deluded to think my side (with current variables) will win in the temporal order. We have a choice- it’s binary (oooh I said the “b” word). For Jesus Christ: fully God, fully human, true King or against. The secularists, the modernist Christians, the syncretist “co-exist” crowd , islam, etc choose against Our Lord. And for those who do so boldly I applaud their honesty. I fear for their souls, but appreciate their candor. At the end of the day, if I am correct, a devout mistaken muslim may well find themselves more in God’s favor than a lukewarm or indifferent Catholic. Which is why muslims and secularists are not my enemy, but islam and secularism are. Agree? Disagree? Something need clarification? Your comments are welcome via direct email. Many miracles at his grave led Christians to venerate him as a saint. One particularly famous story recalls that fishermen were in a small boat in a storm off Palmarola and they called on Saint Silverius for help. An apparition of Saint Silverius called them to Palmarola, where they survived and he is now ow the patron saint of the island of Ponza, Italy. Look forgivingly on thy flock, Eternal Shepherd, and keep it in thy constant protection, by the intercession of blessed Sylvester thy Martyr and Sovereign Pontiff, whom thou didst constitute Shepherd of the whole Church.